Whether you are working in the garden or on a heavy-duty construction site, one way to make sure you do not hurt your back is by using a wheelbarrow for carrying loads. 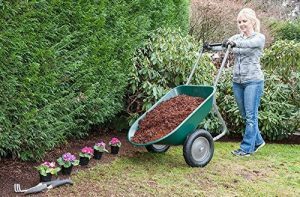 Wheelbarrows are designed to make the work easier and they help to get the job done faster and in a more comfortable way. 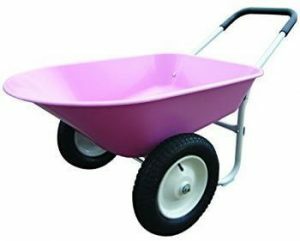 Today there is more than one wheelbarrow brand to choose from, which might make choosing the right one a bit overwhelming. Keep in mind that as with most products, wheelbarrow companies too, strive to keep up with the latest trends and technology, eliminating the things that were proven not functional. 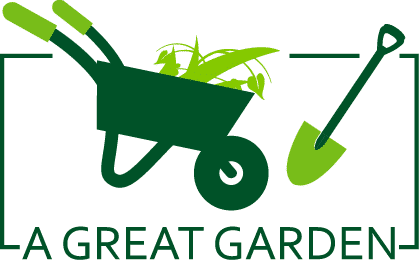 Having this said, the major differences between the best wheelbarrow brands are the way they look, the capacity they can carry and maybe some minor differences in functions. What the one lacks, the other one might feature, making the competition tight. 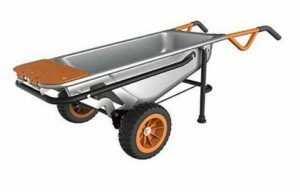 This wheelbarrow looks almost traditional but the combination of the steel and plastic that constructs it together with the main color features being black and orange gives it a modernized, classy look. 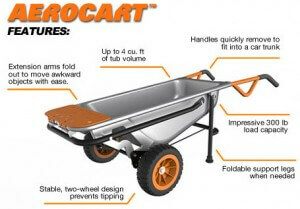 Worx wheelbarrows are multifunctional that is easy to handle as a cart and a dolly. They are designed in such a way that the center of the wheelbarrow adjusts to gravity, making them difficult to tip over by accident. You can carry more than what you have bargained for, because of the extendable foldout arms functions as extra storage space, turning them into a dolly. It is possible to carry a 300-pound load of various sizes with its heavy-duty steel frame. The one thing that might not attract the buyer is the plastic wheels. Duo to its multi-functional capacity, worx is the best wheelbarrow on the market. The Marathon Yard Rover wheelbarrow are not just popular for home gardening but they also made their way to nurseries and farms. 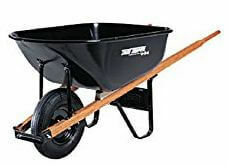 You can also find heavy-duty Marathon Wheelbarrows that are also specifically for construction sites. Due to the dual wheels on this wheelbarrows, the stability is excellent, giving you complete control which allows for easy rolling. The stability of this wheelbarrow will make sure that the heavier loads don’t tip over and at the same time ensures one’s safety. They are made from a high-grade poly material which allows them to be light, therefore easier to use. 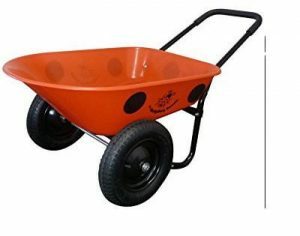 The Marathon Wheelbarrow can be seen as very durable as it is rust resistant and it can rarely be a victim of dents and scratches. Its material also makes it easy to clean. 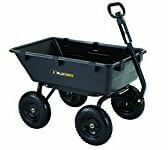 The largest amount that this wheelbarrow can transport is up to five cubic feet of material. Different colors give you various choices to fit your taste. 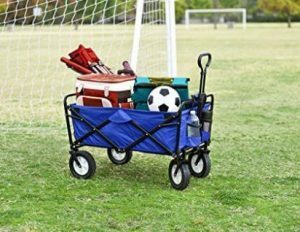 The standard Yard Rover has a load capacity of 300 lbs, a tray width of 27.5″ and a length of 36″, the tray size is 5 cub. and the total weight is 29 lbs. If you are looking for best wheelbarrow for the money, then Marathon wheelbarrow would be your only choice. Gorilla Carts are made for quick and easy unloading because they have a controlled quick-release dumping feature. The two designs that are available are the poly garden chart or the steel utility charts. Each one of these comes in different sizes and different colors. These wheelbarrows are designed with one handle, which gives them the ability to function like a chart. The handle of gorilla dump carts is padded making pulling easier on your hands or it can even be hooked behind a lawn tractor. Thanks to the 13-inch tires, they can handle any terrain. The capacity of the load varies depending on the design you choose, which can be between 400 lbs and 1500 lbs. 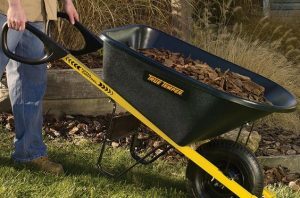 True Temper wheelbarrows can come with a 6 or 8 cubic ft tray making them the ideal size for all types of jobs around the house. They can handle large loads and at the same time, they are easy to use. The trays can be either from steel that is ideal for hauling rocks and bricks or they can be from poly which is better for lightweight, loose materials like gravel. Durable handles can be chosen which are made from steel that will prevent dents and fight against humidity making them impossible to warp. If you prefer comfort, you can choose a True Temper with hardwood handles that will give you a traditional and lightweight feel and at the same time absorbing bounce down the road. The grips on this wheelbarrows handles will give you the greatest control, helping you to unload in one movement while other grips can give you comfort over the steel handles. If you prefer stability, you can opt for dual wheels and for a better movement the single wheel True Temper might be best. Some True Tempers have tires that will never flat while others contain an inner tube holding air that will prevent tipping. 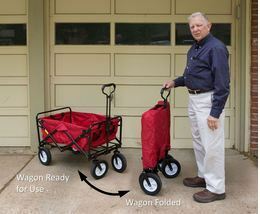 This is more of a utility wagon that runs on four wheels and are made from fabric and steel. It is easy to take along with you where ever you go as the convenient folding and unfolding features makes them portable. They might look fragile because they are made from fabric, but their heavy-duty frames can carry a load up to 150 lbs. 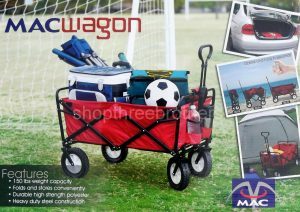 Mac sports folding wagon easy to set up, making your outings to the park, beach or garden more convenient and when the time comes to pack up, it is easy to fold up and find a space for it. The rubber wheels make them stable and easy to pull, while their thick durable fabric comes in different colors to suit everyone’s style. The best way to go when choosing a wheelbarrow might be to look at the desired traits and features that you want. The top five good wheelbarrow brands mentioned above are well-known for being strong, giving good performance and added convenience features. The one you choose will come down to your personal taste and the types of functions needed for your projects. 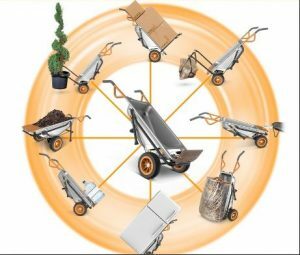 Apart from these five, haemmerlin is also good wheelbarrow brand in UK. If you ask me, who makes the best wheelbarrow among these five ? My answer is WORX, the best wheelbarrow ever. Guest post by: Matt, writer and editor at Georgia Roof Pro .